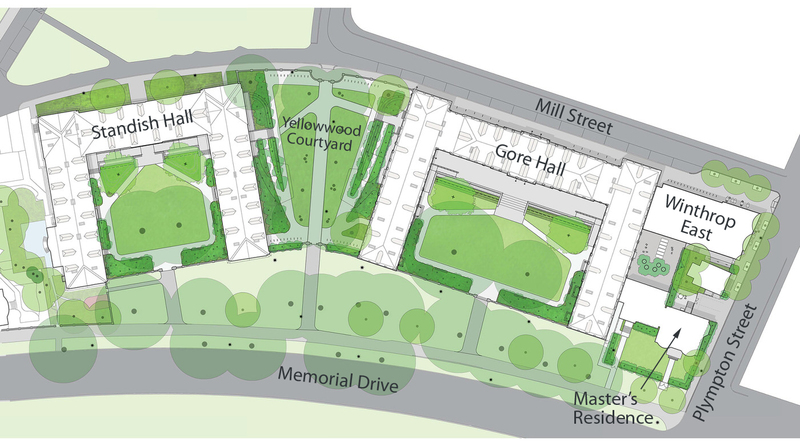 The renovation of Winthrop House includes plans for a five-story addition to Gore Hall at Plympton and Mill streets. The white wood frame house will become the Winthrop House Master's residence. An addition will connect it to Gore Hall, at left. Gore Hall, 1913. The façade recalls Hampton Court. 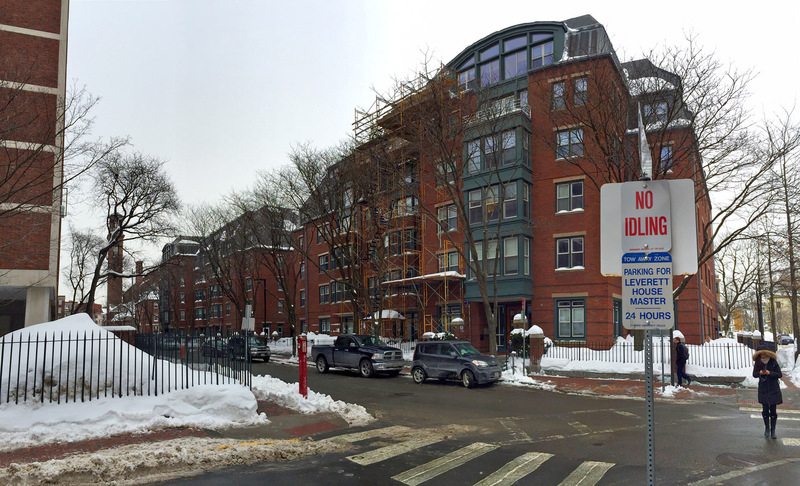 More than 50 Winthrop House residents currently live in apartments on DeWolfe Street. 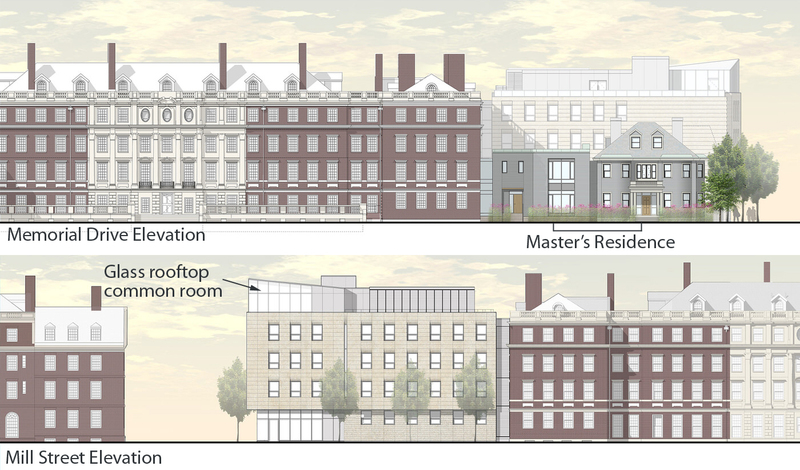 Harvard has released broad sketches of plans for the renovation of Winthrop House; the work is scheduled to begin in 2016 and end the following year. Winthrop will be the second full House, after Dunster, to undergo renewal as part of a $1-billion-plus commitment by Harvard to enhance and upgrade the undergraduate residential House system. (Two earlier test projects were undertaken at Leverett House’s McKinlock Hall and Quincy House’s Stone Hall.) Among the principal changes envisioned at Winthrop are: the construction of a five-story addition to Gore Hall that will not only bring more than 50 students now living in “overflow” apartments on DeWolfe Street back to the House, but also include a glass-enclosed rooftop common room and open-air terrace with views of Cambridge, the Boston skyline, and the Charles River; a separate master’s residence, created by the reconstruction of a wood-frame building at the corner of Plympton Street and Memorial Drive that will be linked by new construction to Gore Hall; and expansion of the existing dining hall to accommodate all House residents. Improvements to the dining hall, a key facet of undergraduate life (particularly at Winthrop, with its distinctive, elevated, double-stair entrance) include an expansion and lowering of the adjacent outdoor terrace to make it accessible from the dining area. 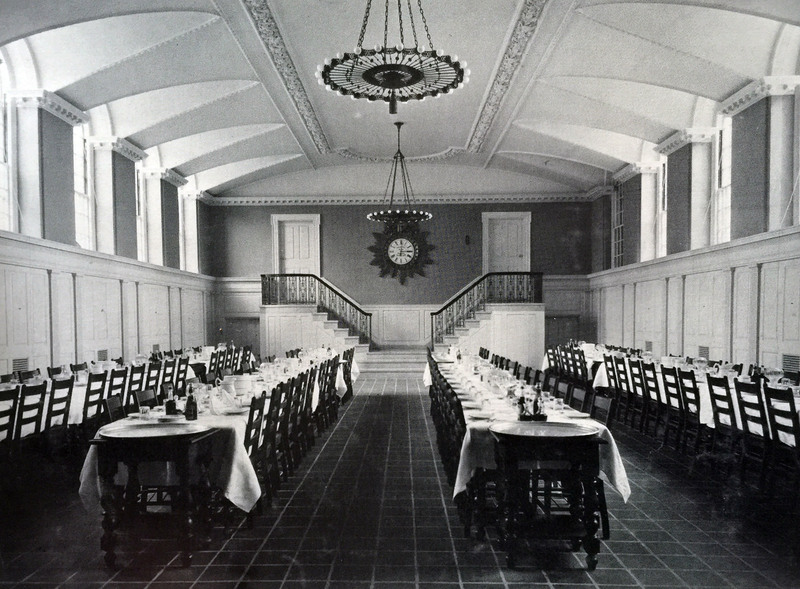 This will also permit additional natural light into the two-story hall; that amenity has been limited because the hall’s lower story is below grade, says Merle Bicknell, assistant dean for physical resources in the Faculty of Arts and Sciences (see the accompanying 1913 photograph of the dining hall). As is the case for Dunster residents during the current 2014-2015 academic year, Winthrop residents will relocate during 2016-2017 to the former Inn at Harvard and other nearby housing while their House is undergoing renovation. Winthrop will reopen in the fall of 2017. Read coverage of the Winthrop House renewal in the Harvard Gazette and the Harvard Crimson. Updated 2/13/15: The Cambridge Historical Commission has not approved the Winthrop East addition, as originally reported (based on incorrect information supplied to Harvard Magazine). Instead, the Cambridge Historical Commission is acting in an advisory role in support of Harvard’s application for project approval from the Massachusetts Historical Commission.